We are excited to announce the first AFL Sapphire Coast ‘Hot Shots of the Week’ thanks to Domino’s Tura Beach. Up first we have Nicole Betts from the Narooma Lions. 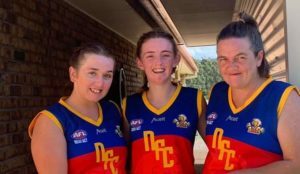 Nicole has five daughters and has been involved with the Narooma Lions for 7 years now since her daughters (Hollie-Kae and Zalie) began playing. Nicole is on the Lions committee and runs the clubs canteen on match day along with being the Women’s Team Manager for the past two seasons. 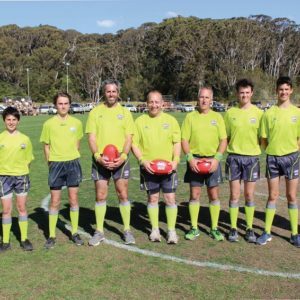 On the weekend, with the Lions struggling to fill numbers for the Women’s team in the opening round, and having never played a game of football in her life, Nicole showed her dedication to the club by throwing on the Lions jumper to make her football debut, but more importantly ensure the Narooma Lions fielded a team to avoid a forfeit! And to top it off, Narooma scored a big win over the Diggers to ensure Nicole finished the day with a Gatorade shower. What a star and a deserving winner of the first ‘Hot Shot of the Week’! The second ‘Hot Shot of the Week’ is also a Senior Women’s player, Sarah McMahon from the Tathra Sea Eagles. Similar to Nicole, Sarah has been a dedicated volunteer and supporter for many years but hadn’t played a game of football before last weekend. 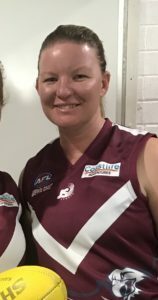 Sarah is a wonderful volunteer who always put her hand up to help and is on the Sea Eagles committee and is also the team manager for the Under 14s side. 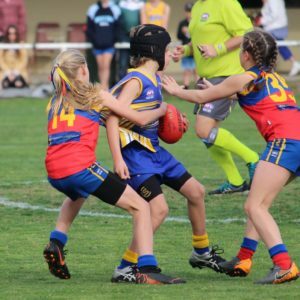 Sarah has been around football for many years but in the off-season decided the time was right to play the game herself, and after showing dedication to training since the start of preseason, made her debut on the weekend against Pambula. And what a debut it was! In addition to Tathra winning the match, Sarah also kicked two goals herself to cap off a wonderful debut! Not a bad way to calm those first game nerves! Congratulations to both Nicole and Sarah for their achievements both on and off the field and we thank you for your dedication to your clubs and the league. 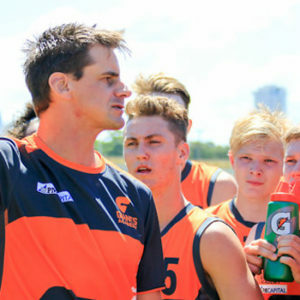 If you have someone in your club across the weekend who has a standout individual performance on the field, shows great sportsmanship, goes above and beyond off the field, or just deserves recognition for their service to their club, the umpiring group or the league generally, please nominate them by emailing Mitch a short write up, along with a photo of them. Each weekly winner will receive a ‘Hot Shot’ pizza voucher thanks to Domino’s Tura Beach as a reward for their efforts.